Many consumers, members of the media and even phone fanatics are looking at the LG G5 as though it were the first handset to come from LG with a modular design. We will let you in on a little secret; LG had an earlier handset with a modular design. More on this later. Let's talk first about the modular features on the LG G5. With the LG G5's "Friends," you can improve the camera using the LG Cam Pro. This turns your phone into a DSLR camera with a shutter button, an improved grip and 1200mAh of additional battery life. Another pal, the LG Hi-Fi Plus with B&O Play, will jack up the audio on the phone. There are other Friends including the LG 360 Cam, the LG Tone Platinum headset, and the LG Rolling Bot. Not all of them are available everywhere, and some of them have yet to launch. As we said, the LG G5 is not the manufacturer's first modular handset. Back on March 1st, 2009, the LG Versa was launched as an exclusive for Verizon. The featurephone had a resemblance to the LG Dare, but with a major difference; various modular accessories could be added to the phone. One such option was the physical QWERTY keyboard that came with the handset out of the box. It was attached to the LG Versa by using the docking system found on the rear of the phone once the battery cover was removed. The front had a small 56x120 pixel blue OLED screen that revealed signal strength, battery status and more, foreshadowing some of today's high-end cases for flagship phones. There were other modular accessories produced for the device. One for gamers that included an 8-way d-pad and four controller buttons, went on sale for $29.99. One that was supposed to offered enhanced audio never was produced. Move ahead seven years, and LG has taken the modular concept, improved it greatly, and made it a core feature for the LG G5. LG are true innovators. They had an early smart watch too, but now one cared. Kudos tho! Kudos LG! My G5 has none of those problems. Definitely not the 'first' modular phone though. Modular concepts go even way back to 2001 with the Ericsson T68, where you can attach a camera. For me my first touch screen smartphone was 5530 Xpressmusic,great one. I wish I could +100 this brilliant comment. i had the samsung instinct. hehe. 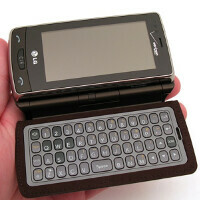 I had this phone ans I loved it! I thought it was so cool that I could take off the keyboard... haha oh how times have changed. I feel as though a modular phone would more benefit someone on a trip more then everyday use, unless you carry a backpack or lord forbid, a fanny pack. I never understood why they made this phone brown with a poo brown themed ui.